This article lists the most common errors and technical issues that you will most likely encounter on the Linksys Wi-Fi Router, E4200. For its general specifications and system requirements, click here. If you’re having problems with the router’s wireless settings, click here. If you want to learn how to change the router’s administrator password, click here. NOTE: Most of these issues are currently being addressed and will be fixed in future firmware releases. 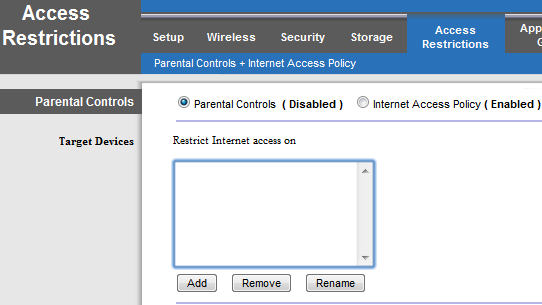 On the Access Restrictions > Parental Controls + Internet Access Policy page, the Remove and Rename buttons appear clickable when clicking on the Target Devices box. Clicking on these buttons before adding a target device will generate an error message. On certain versions of Safari®, clicking on Cancel on the Storage > Administration > Create New Group pop-up box will not do anything. You would have to close the window instead. 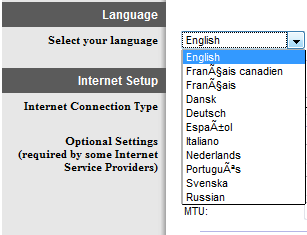 When using Firefox, clicking on Select your language drop-down while it is set to English will display random characters on some of the other options. 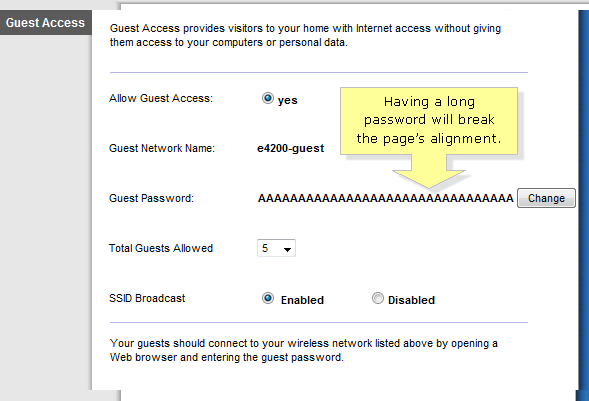 The Guest Access page’s alignment breaks whenever you assign a long password. For wired connection users, you may not be able to access SAMBA and FTP services for a certain period of time after you have created 20 users or 20 groups. Media files with special characters will not be displayed on the list. It is not recommended to use special characters when naming your files. The UPnP Media Server Database folder cannot be deleted when your storage device is on HFS format. Not all read and write access will be changed after the UPnP Media Folder is created or when a USB storage device is plugged into the router. Clicking on Continue after clicking on Safely Remove Disk will sometimes generate an error message. If this happens, wait for a few seconds before clicking on Continue. When having a wireless computer switch access from the “-guest” network to the primary one, the Wireless Client List will continue to display the computer under the “-guest” network; but the wireless computer will connect to the main network IP address. When the router’s wireless security is turned OFF and you connect a Windows 7 computer wirelessly, it will trigger the Wi-Fi Protected Setup™ (WPS) process. The router should not treat this as an unsuccessful attempt and you should still be able to connect to the wireless network. When wireless security is disabled, the Internet blocking page redirect feature of Trend Micro Internet Security Pro 2010™ works slowly, or fails. When you are using WPS, the light flashes continuously. You will need to disable this feature and choose Manual under the Wireless tab > Basic Wireless Settings sub-tab if you want the LED to stop blinking. To know how to configure your wireless settings manually, click here. * A firmware glitch that causes abnormal LED activities on the Linksys Wi-Fi Router, E4200 has been resolved in firmware version 1.0.03. If you are consistently experiencing the blinking light for more than three (3) minutes even after disabling the WPS, you may need to upgrade your router’s firmware. To know how to do this, click here. Users who have problems enabling the media server functionality on the Linksys Wi-Fi Router, E4200 needs to upgrade the router’s firmware. This issue is commonly encountered when the router is running firmware version 1.0.02 but can be resolved by upgrading the firmware to version 1.0.03. On the Administration > Log > View Logs page, clicking on Clear will clear out all logs instead of just one (1) section (i.e. clearing all incoming logs will also clear the DHCP client log). Creating a shortcut or drive mapping to a USB device that is currently attached to the Linksys Wi-Fi Router, E4200 will create a .storage_info file. It is recommended to keep this file as it contains the storage device’s access configuration. The router’s web-based setup page is used for changing advanced settings on your network. For common tasks such as Guest Access and adding new devices to your network, it is recommended to use Linksys Connect, the software bundled with the Linksys Wi-Fi Router, E4200. For instructions on how to set up the router using Linksys Connect, click here. You may encounter an issue wherein you cannot get online simultaneously on multiple devices. To resolve this issue, you need to ensure that your modem’s Ethernet cable is properly connected to the router’s Internet port. For wired connections, you need to check if your computer is connected to your router’s Ethernet port. To learn how to resolve intermittent wired connections using a router, click here. When using wireless devices, you need to check if the computers are properly connected to your wireless network. To know more about connecting wireless computers to your network, here. To learn how to resolve intermittent wired connections . To know more on how to resolve intermittent wireless signal, click here. If you're still having connectivity problems for both wired and wireless devices, you may need to download and upgrade the router’s firmware. To learn more on how to do this, click here. The device may heat up when installed in a poorly ventilated location. This would cause the device to reset to factory defaults, losing the configuration that you have saved on the device. It is recommended to install the device on a solid surface in a well-ventilated area to prevent overheating.